Lock in a great price for Wildercombe House – rated 9.7 by recent guests! Great for parking, very welcoming, very comfortable bed, lovely large room, very clean, great big telly with lots of channels, proper sized soaps etc, fab breakfast with lots of choices, great location. Lovely hosts and advised us about places to eat in evening. We even arrived a little early and they welcomed us allowing us to check in. Old interesting house beautifully refurbished. Nice ambiance. The room was spacious so there was somewhere to put our open luggage. My bedside light was faulty but it was sorted as soon as I reported it. It was possible to use the hairdryer and the mirror simultaneously. There was a lift. We loved evrrything about the place. The atmosphere, the welcome, the food and the incredible recommendation fornone of the nicest and friendliest restaurants we have been to. Would definitely recommend staying here and enjoying the beautiful house and its surroundings. Very clean and well presented. All the staff, including the owner, were very pleasant and friendly and the information on local amenities very welcome.The bed was very comfortable and all furnishings throughout (like the hotel itself and the refurbishment completed by the owners) were good quality and aesthetically pleasing. The lift was a bonus. Extremely friendly and professional staff, and a lovely spacious room with a very large, comfortable bed. The breakfast was also delicious. Very good breakfast, beautiful bedroom, great facilities. The restoration has left this fine old building very handsome and exceptionally well engineered. This all made it wonderfully comfortable and welcoming. Add to this the very fine and friendly host, Ann Marie (and her daughter who was also a perfect gem for helping with breakfast), and you get a first rate stay. One could not have asked for more personal or friendly service Bravo. My wife and I hope to return. Superb location just outside of the town. 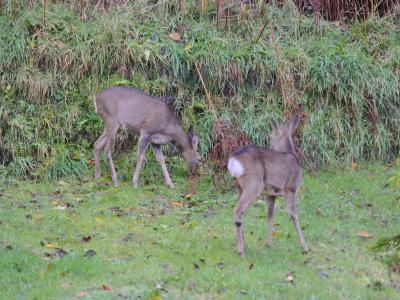 A warm friendly welcome on our arrival, nothing was to much trouble. Absolutely stunning room and facilities, well maintained and spotlessly clean. And last but not least, the breakfast was perfect. My partner and I will definitely be making another visit. Wildercombe House This rating is a reflection of how the property compares to the industry standard when it comes to price, facilities and services available. It's based on a self-evaluation by the property. Use this rating to help choose your stay! Wildercombe House offers award winning Bed and Breakfast accommodations, located in the coastal town of Ilfracombe, North Devon, with sea views, free Wi-Fi throughout and free parking on site. The property also features a elevator, disability access and rooms for disabled guests. Wildercombe Houses’s spacious, wooden-floored dining room has views of the Welsh coastline. Breakfast is served each morning and includes full English options, and lighter continental choices, with meals made from local ingredients. Guest bedrooms are light and airy with oak furniture and a HD TV with private bathrooms providing an LED mirror, towels and free toiletries. Within easy reach of The Tunnels Beach and Ilfracombe Harbor, Barnstaple is only a 25-minute drive from the building, and the edge of Exmoor National Park can be reached in 20 minutes by car. 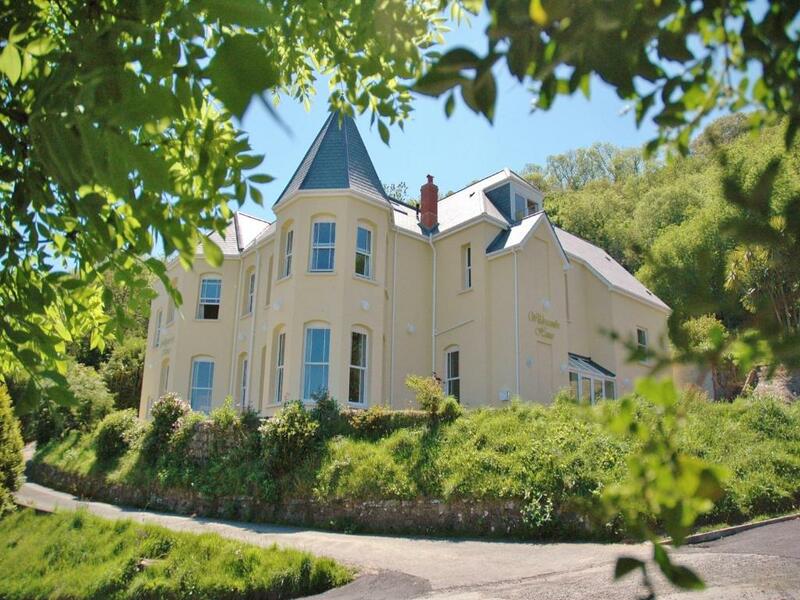 Ilfracombe Golf Club is 3 miles from Wildercombe House. 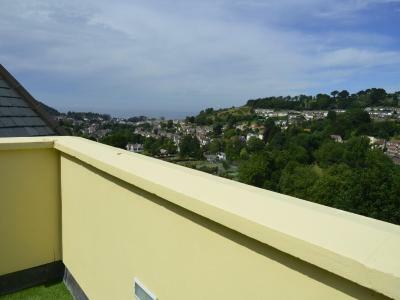 This property is also rated for the best value in Ilfracombe! Guests are getting more for their money when compared to other properties in this city. When would you like to stay at Wildercombe House? This room has a standard double bed, a seating area and views towards the countryside. There is an en-suite with walk-in shower, LED demister mirror, a heated towel rail, towels and toiletries. The room features an HD TV with Freesat, tea/coffee making facilities and free WiFi. This budget double room has a standard double bed. Please note this room cannot accommodate a travel cot. This internal room is located on the ground floor and the room does not have views. The room has a standard double bed and an en-suite walk-in shower, LED demister mirror, heated towel rail, and toiletries. The room features an HD TV with Freesat and tea/coffee making facilities. This triple room has a king-size bed, a single bed and offers views towards the sea. The en-suite has a walk-in shower, LED demister mirror, heated towel rail, towels and toiletries. This room can accommodate a child, please clarify the request and extra charges apply as per policy. This room has a super king-size bed, a seating area and panoramic views of the sea, town and countryside. There is an private bathroom with a bath and overhead shower, LED demister mirror, heated towel rail, towels and toiletries. This room has a standard double bed, with a restricted view of the garden. There is an en-suite shower with an LED demister mirror, heated towel rail, towels and toiletries. Book in conjunction with 'Double - Ensuite with Bath' to become the Family Suite, behind your own 'front door'. This ground floor room has a standard double bed and a single bed, as well as an en-suite shower wet room with an LED mirror, towels and toiletries. There is also an HD TV, tea/coffee making facilities, and free WiFi. This room has disabled access, emergency pull cords and vibrating pillow pad in this room. For an additional supplement, this room can be configured as 1 double bed and 1 single bed. This must be requested via the Special Requests section, subject to confirmation by property. Accessible compliant room, with a standard double bed and sea views, located on the first floor which is accessible with elevator or stairs. The en-suite wet room has a shower with shower seat, grab rails and additional sink, LED demister mirror, heated towel rail, towels, emergency pull cord, and toiletries. There is an emergency pull-cord, vibrating pillow, and wardrobes with half-height hanging rails and low mirrors. This double room has a standard double bed and offers views of the garden. It is located on the first floor and accessed via the elevator or the main staircase. The en-suite has a shower cubicle, LED demister mirror, heated towel rail, towels, and toiletries. The room features an HD TV with Freesat, tea/coffee making facilities, and free WiFi. Please note this room cannot accommodate a travel cot. With a super-king bed and panoramic views of the sea, town and countryside. The private bathroom has a bath and separate steam shower cubicle, an LED demister mirror, heated towel rail, towels, and toiletries. The room features a lounge area, an HD TV, tea/coffee making facilities and free WiFi. This room has a standard double bed and views of the garden. The private bathroom has a bath with shower over, an LED demister mirror, heated towel rail, towels and toiletries. Book in conjunction with 'Double - Ensuite with Shower' to become the Family Suite, behind your own 'front door'. Accessed by a small flight of stairs, this room has a super king-size bed and offers a view of the garden. There is an private bathroom with a spa bath, a separate shower cubicle with body jets, an LED demister mirror, guest towels and toiletries. The room features a walk-in wardrobe, an HD TV with Freesat, tea and coffee making facilities and free WiFi. This room has an private bathroom with a walk-in shower, an LED demister mirror, guest towels, and toiletries. There is also a HD TV with Freeview and on-demand TV and tea and coffee making facilities. A travel cot cannot be accommodated in this room. Accessed by a small flight of stairs, this room has a super king-size bed, a walk-in wardrobe, and views of the garden. There is an private bathroom with a bath and overhead shower, an LED demister mirror, towels and toiletries. Also included is an HD TV with Freeview and on-demand TV, and tea and coffee making facilities. This double room features a super king-size bed, an HD TV, tea/coffee making facilities and free WiFi. There is an en-suite bath with shower over. Towels and complementary toiletries are provided. This room has ceiling windows. This room features a super king-size bed and a skylight. It includes a seating area, a TV with Freeview channels and tea/coffee making facilities. The room has a balcony and sea views. Guests will have access to an private bathroom with walk-in shower. Towels and free toiletries are provided. This room features a king-size bed and a skylight, a TV with Freeview channels and tea/coffee making facilities. The room has a rooftop balcony, providing sea and countryside views. Guests will have access to an private bathroom with bath and overhead shower. Towels and free toiletries are provided. House Rules Wildercombe House takes special requests – add in the next step! Wildercombe House accepts these cards and reserves the right to temporarily hold an amount prior to arrival. The first night will be charged upon making a reservation. Cleanliness, toiletries, room decor and bed comfy. Breakfast was fabulous and all hit. Hot buffet breakfast. Would have preferred table service as the food not overly hot and no fried egg. Room size, very clean and location. Some breakfast items missing if you don't come down first thing. Location was great and close to many attractions. The place itself was spotless and clean. The owner was very friendly, helpful and welcoming. Highly recommended. The hotel was amazing .... very clean... our room was very modern and great decor throughout also spacious... the staff and owner made us feel very welcome...the breakfast was well supplied... from fruit,yogurts and cereals to a full English. 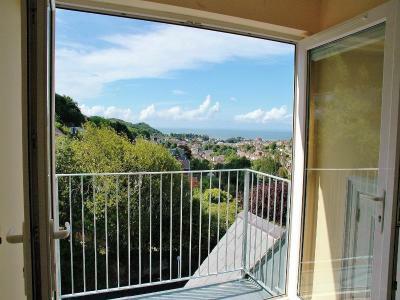 Also a good location with great views... 5mins by car to the high street and harbour... where theres bars, restaurants and shops.. or 15 to 20 min walk.